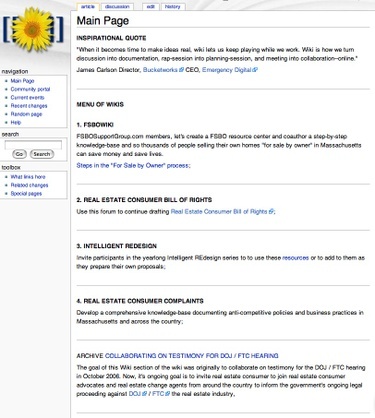 SNEAK PREVIEW: Real Estate Cafe’s experimental new FSBO Wiki! "When it becomes time to make ideas real, wiki lets us keep playing while we work. Wiki is how we turn discussion into documentation, rap-session into planning-session, and meeting into collaboration–online." On and off over six months, The Real Estate Cafe has been quietly building a "menu of wikis" with four to five main areas. A snapshot of the current version of our main page, which is still password-protected, is shown above (click on image for larger view) or read text on the link below. If you’d like in see where we’re headed or explore collaborations, or just selling your own home "for sale by owner" in Massachusetts and want to learn more about the steps in the process — wiki-style, email RECafe@mac.com. If you’re wildly excited about wikis, maybe we’ll see you here in Cambridge, Massachusetts for WikiMania 2006. Today (March 30, 2006) is the deadline for submitting a proposal to host a workshop or tutorial at this year’s Wikimania. This morning, we learned that one of the leading real estate blogs in the country, Curbed.com, has been hosting a series of monthly real estate round tables to discuss the state of the housing market in New York City. The Real Estate Cafe and other leading bubble bloggers in Boston began a similar series of collaborative chats 12 days ago, and we were thrilled that our first "Bubble Hour" generated 36 pages of content including over a dozen graphs. Please let us know if you’d like to participate in the next Bubble Hour, and whether you would prefer to participate in an online chat or a offline meeting by emailing RECafe@mac.com. The Massachusetts Association of Realtors will announce their official February housing report on March 23, 2006. Until then, you can help shape the content of the next Bubble Hour by posting your question below, or recording a message on our blog reader line (617-876-2117) for future use in our real estate podcast. 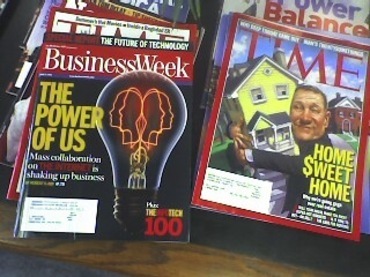 We’re eager to add more content to our real estate bubble "audio time capsule." Field reports and market observations from home buyers and sellers in Greater Boston and across Massachusetts are most welcome. Over the past few months, a number of us have corresponded about getting together OFFLINE with other bubble bloggers in Boston / New England. If getting together for one or both of the proposed events below make sense to you and your blog readers, feel free to pass this on or link to it. 1st Boston bubble blogger meeting: Exploratory meeting for "citizen journalists"
2. Berkman Center (see link for location) from 7:00pm to 8:00 or 8:30pm. Berkman’s guest speaker from Newsvine should help all of us get more visibility for our individual blogs and enhance our mutual goal, as independent citizen journalists, of informing consumers about real estate market trends in Greater Boston / Massachusetts. RSS Fuss: $100 million in VC, Cambridge, MA: Rate My Host Blog.